We also offset all reigns to start at the same time (a reign starts the year that a rider wins a race) so we could compare each rider at the same points of their winning reign. 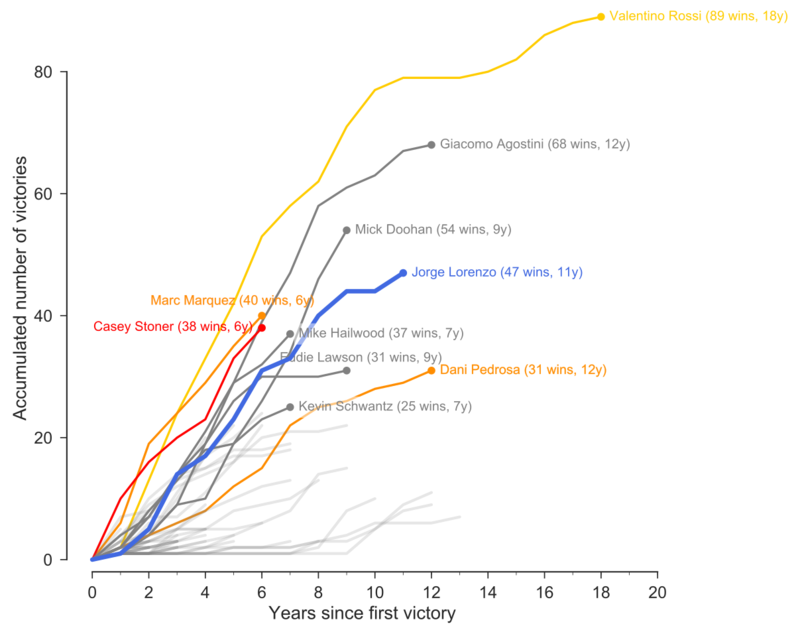 There, we could see that Rossi has been constantly above any other rider for most of his career, meaning that he had more wins that anyone else at the same point of each rider’s reign. However these graphs (an derived conclusions) have a fundamental problem. They don’t take into account that nowadays there are considerable more races per year than they were in the past. When MotoGP started, in 1949, the race calendar had 6 races for the whole year. That number has been steadily increasing all the way to the 19 races of this season, and maybe even 20 for next year, if Mexico finally makes into the calendar. This makes comparing the number of victories of riders of different eras skewed in favour of the more recent riders, as it is easier to win 1 race in a calendar with 18 races than in a season with 6. A way to avoid that bias is to normalise the number of victories per year, so instead of all wins counting as 1, a win in a championship with less than 19 races (as in the 2018 season) will count as more than 1. So for instance: a victory last year (with 18 races) counts as 1.06 normalised victories, and a victory in a season with 10 races (like 1975) counts as 1.9 normalised victories. In this case we highlighted riders with at least 35 wins -instead of 25, as before- so only 11 riders gain the label of champion, as decided by the motogpdata ring of elders, in an attempt to prevent too much clutter on the plot. This new criteria means that Dani Pedrosa (8th racer in number of victories, with 31) is greyed out as he becomes the 13th racer per number of normalised victories, with 33. Kevin Schwantz also looses the label of champion, with 32 normalised victories. On the other hand, we now have John Surtees (62 normalised victories), Geoff Duke (56), and Kenny Roberts (38) as newly crowned champions. So back to the top class. Below the man who won every single 350cc and 500cc race in 1968, 1969, and 1970, we find Valentino Rossi, with 101 normalised victories. Behind, Hailwood overtakes Doohan as the third most successful rider with 78 normalised victories. Interestingly, John Surtees (62) and Geoff Duke (56) are now considered more successful riders than the recent crop of Lorenzo (52), Marquez (46), Stoner (41), and Pedrosa (33). If we offset all reigns, so they all start together, we can see that the previously dominant Valentino Rossi is now surpassed by Surtees. Surtees, with 62 “modern” wins, ended his 5 year reign in two wheel racing (in 1960) to focus on four wheel racing, where he feared pretty well, adding the 1964 Formula 1 title to his four 500cc and three 350cc motorbike GP titles. Mike Hailwood was also more successful than Rossi, after a 7 year reign, when he retired prematurely, forced by Honda pulling out of Grand Prix motorcycle racing. Interestingly, Marquez and Stoner are now very equal to Eddie Lawson, sandwiched in between Geoff Duke and Kenny Roberts. By obtaining the normalised number of victories for each rider, computing each rider reign, and offsetting them, we can compare riders from very different racing periods. However, the circle can’t only be squared to a point. We can’t forget that we are comparing riders that faced completely different challenges. That we ignored the role of lesions, the quality and reliability of the machinery they had, the team, the level of the competition, etc. And as such, we should take any conclusion with a bucket of salt, as we are nonetheless comparing the incomparable. Previous PostPrevious Lorenzo through Lorenzo’s eyes. Next PostNext Who want enemies when you have teammates?